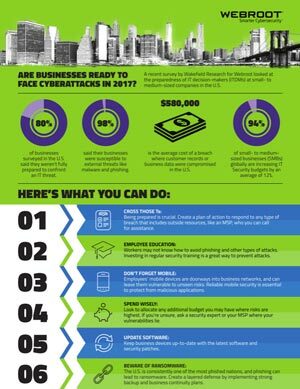 Cyberattacks pose a real threat to your business. Are you prepared? Do you have the right technology and processes in place to protect your bottom line from constantly changing cyber threats in 2017? Most small to medium sized businesses (SMBs) worldwide say no. Andrea Tompkins from Colorado Computer Support discusses the MSP take on the survey. of small business IT decision-makers (ITDMs) worldwide aren’t ready to address cyber threats. That number is even higher in the U.S. and U.K.
of US ITDMs are unprepared. in the UK aren’t confident they can handle threats. of Australian ITDMs report are ill-equipped. What are the main security concerns of SMBs worldwide ? To find out, we commissioned a study with Wakefield Research. 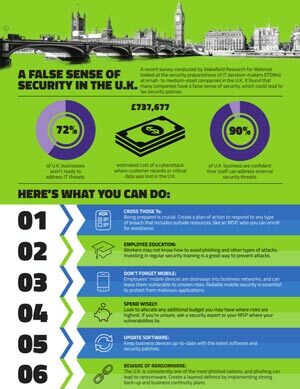 View the full report to find out how businesses in the US, UK, and Australia are preparing to face the cyber challenges of 2017.